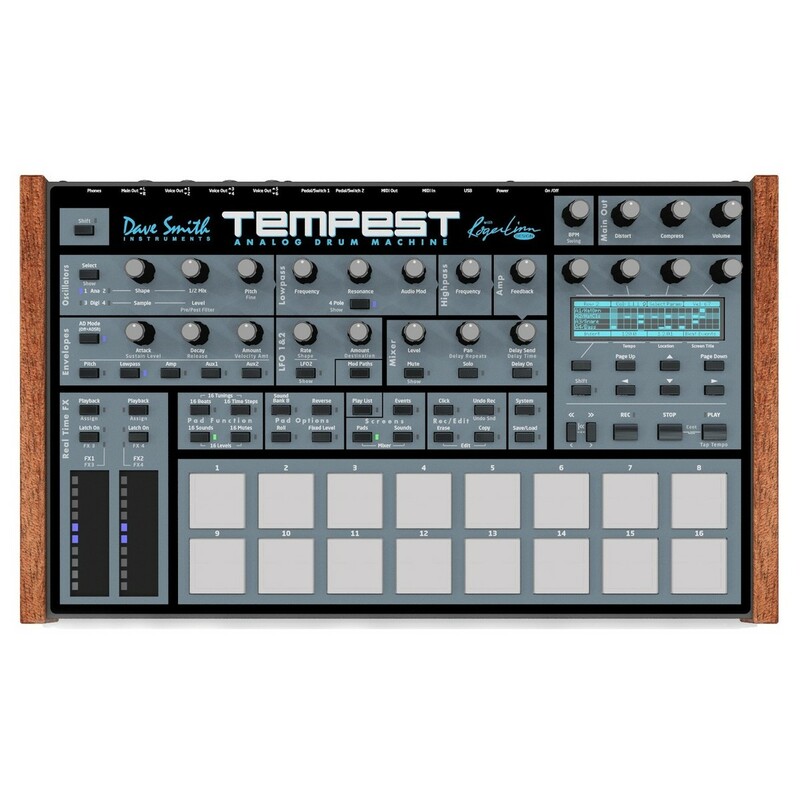 The Dave Smith Instruments Tempest Analog Drum Machine is a compact and highly versatile drum machine synth featuring sixe powerful analog voices. The 16 velocity-sensitive pads are perfect for live drumming, allowing you to program your drum sequences with ease. The on-board sequencer allows you to record a drumbeat in real-time. The 256 x 64 dot OLED display provides information on presets, sounds and more. 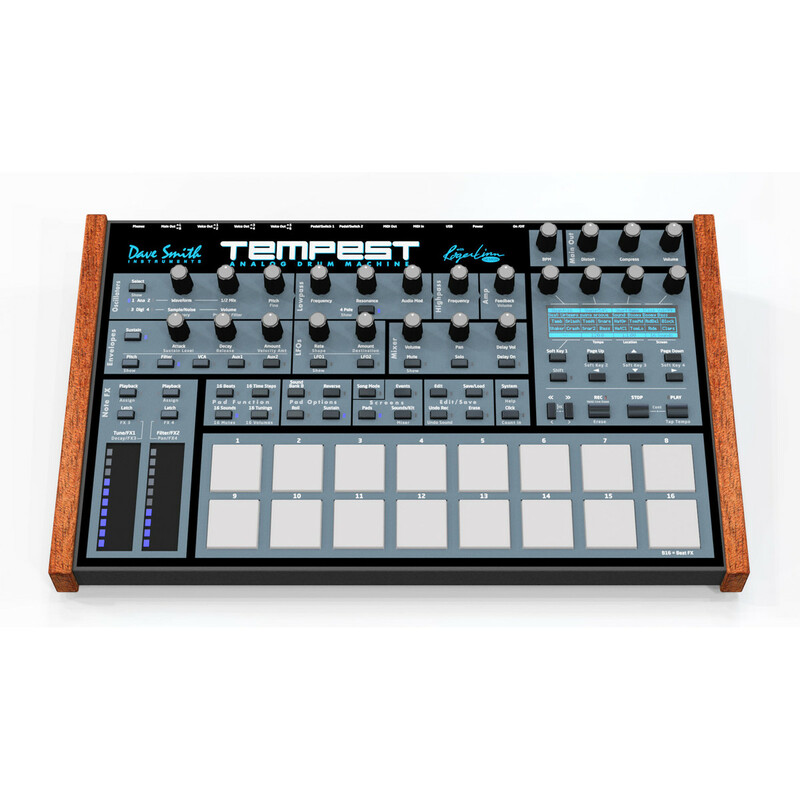 The Tempest Drum Machines allows you to create, edit arrange and manipulate beats in real time, whilst being highly portable. It also includes two touch controllers for added versatility. The Tempest's six analogue voices each have two analogue oscillators plus two digital oscillators (with a large bank of included samples), the classic Curtis analogue low-pass filter with audio-rate modulation, an additional high-pass filter, analogue VCA with feedback, five envelopes, two LFOs, an extraordinary variety of analogue modulation routings and stunning sonic quality, warmth and punch. 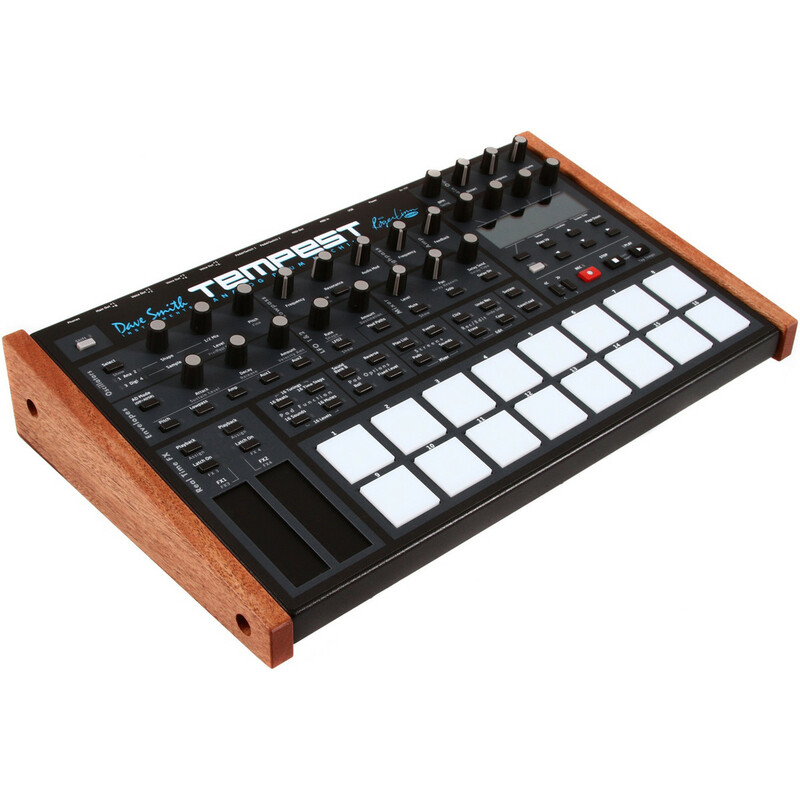 It excels at tuned sounds as well as drum sounds and can double as a six-voice analogue keyboard synth. The Tempest has sixteen pressure- and velocity-sensitive pads arranged in a 2 x 8 configuration. This gives intuitive access with all your fingers, and is an ideal compromise between the 4 x 4 pad arrangement typical of real-time programming and the 1 x 16 of step programming. The Tempest does both, as the pads can be used to play thirty-two drum sounds (two banks), mute/unmute the sounds on playback, play and arrange sixteen beats in real time, play one sound at sixteen tunings (in a variety of scales) or sixteen velocities, or as sixteen time steps for step programming. Drum rolls and repeated groove patterns can be created with the ROLL button, by varying pad pressure as the beat records, and it doubles as a momentary "stutter" effect when the pads are assigned to play beats. There are two pressure- and position-sensitive Note FX slide controllers to allow real-time recording of note or beat-wide sound parameter changes into the drumbeat as you play. You can record simultaneous filter frequency, tuning, envelope decay and pan changes for each note. With the Playback key you can use the slider to override these parameters on playback, and record it back into the beat. They can also be used in performance to alter beat-wide sound parameters like low-pass frequency or resonance, high-pass frequency, and envelope attack or decay. 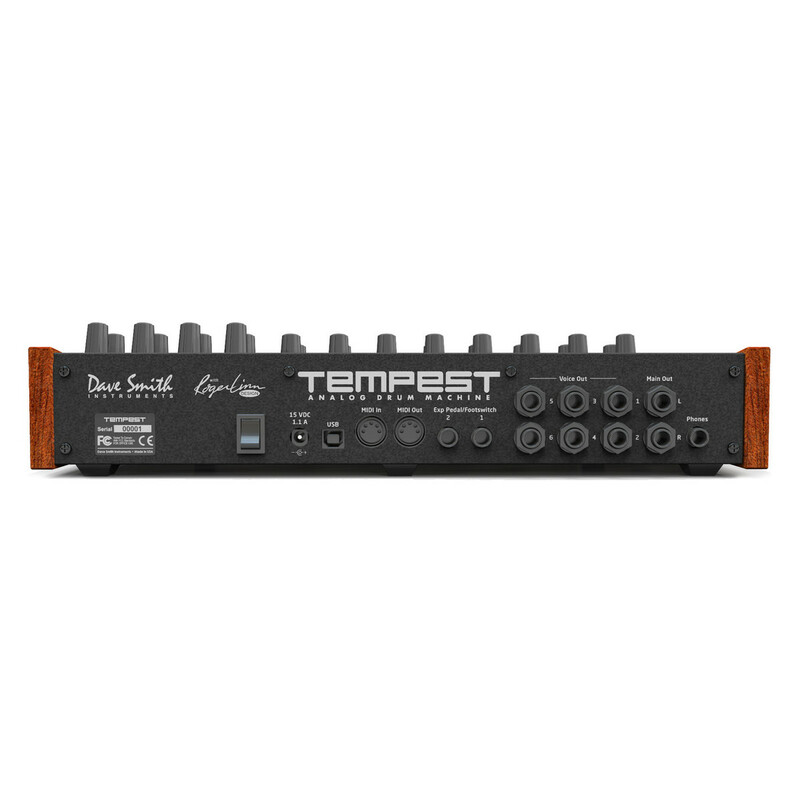 The Tempest has six stereo direct voice outputs, plus stereo mix outputs and phones outputs, two inputs for foot switches or expression pedals, MIDI in/out and USB.